Cover of the TV series. 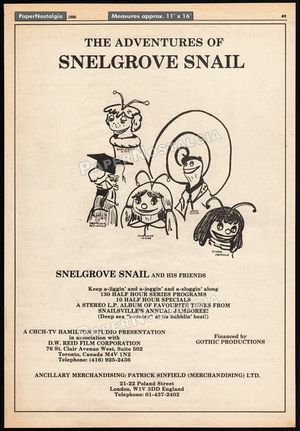 The Adventures of Snellgrove Snail is a 1979 Canadian puppet TV series. This series was created by D.W. Reid Film Company and was voiced by Helene Buwalda, Joyce Clarke, and Barrie McLean. It originally debuted in Canada on CHCH-TV from September 22, 1979 until at least April 5, 1980, but it also aired in New Zealand on TVNZ and Untied States on syndication. The series follows the underwater village of Snailsville and its gastropod inhabitants. On June 12, 2018, a YouTube user going by the name AH2 AH2 uploaded two eight-minute low-quality recordings of two segments from the show, being "Nose for News" and "The Truth About Gossip". A poster on eBay reveals that there were a total of 130 half-hour episodes made, as well as 10 half-hour specials. On August 17, 2018, LMW user Spacegerbil got into contact with the head puppeteer and puppet builder for the show, Tom Vandenberg, who unfortunately could not provide much information on the show. On August 23, 2018, user TropesAreDangerous uploaded a VHS release titled "Too Many Cooks Snelgrove Snail" under YouTube username TheBoss and to the Internet Archive. This tape runs for 24 minutes and contains the segments "Too Many Cooks", "The Truth About Gossip", and "Nose for News", at roughly 8 minutes each. This reveals that the half-hour episodes were actually pieced together from multiple segments and that the existing segments for "The Truth About Gossip" and "Nose For News" were complete. It is not known whether segments were reused for different episodes, or if each episode had all unique segments. If the segments are all unique, then this could translate to 390 individual segments for the regular episodes alone. However, the format for the 130 television series programs and ten specials is currently unconfirmed. 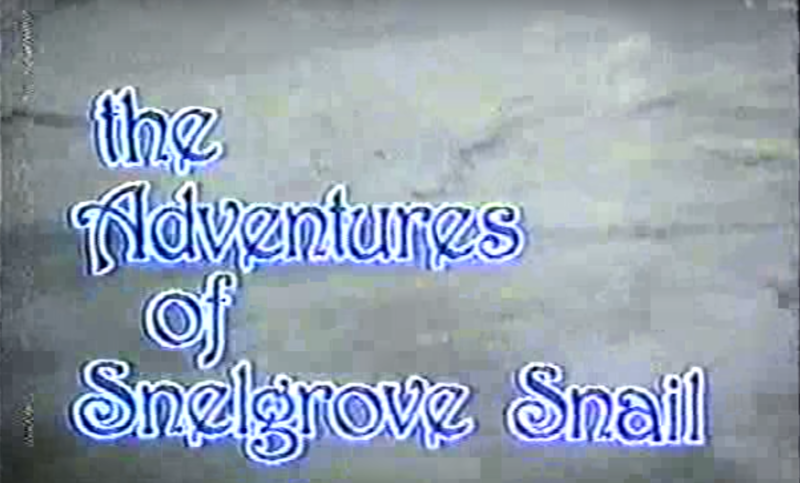 On August 24, 2018, TropesAreDangerous uploaded a 42 minute VHS release titled "The Undersea Adventures of Snelgrove Snail: Muddy Gras in Snailsville" to YouTube under username TheBoss and the Internet Archive. It contained the aforementioned "Muddy Gras in Snailville", which was 24 minutes and is likely one of the ten special episodes. It also contained the sequences "Act with Tact" and "Mirror up to Life". On September 4, 2018, TropesAre Dangerous uploaded a 24 minute (incorrectly labeled as 35 minute) VHS release titled "It Takes All Kinds" to YouTube under username TheBoss and the Internet Archive. It contained the segments "It Takes All Kinds", "Secret Admirer", and "Fishtory". A VHS-rip of the show's opening sequence. Poster revealing the count of episodes and specials. Courtesy of eBay seller papernostalgia). ↑ The IMDb page for the show. Retrieved 12 Mar '17. ↑ TVArchive Canada article on the show. Retrieved 12 Mar '17. ↑ The Ottawa Journal from Ottawa, - Page 93 Retrieved 15 Mar '17. ↑ The Ottawa Journal from Ottawa, - Page 89. Retrieved 15 Mar '17. ↑ Titusville Herald, October 11, 1980, Page 11. Retrieved 15 Mar '17. ↑ BuddyTV overview. Retrieved 12 Mar '17.